Hawkman is a comic book superhero in the DC Comics universe. He is characterized by a costume with large artificial wings on a harness, and a belt with a special metal which allows him to fly. He often uses archaic weaponry to fight crime. 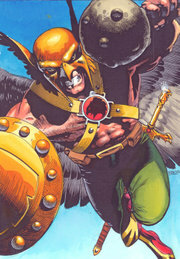 The name "Hawkman" has been applied to several fictional characters in the DC universe. Hawkman is also the name of four different comic books series featuring the character, who has also appeared in Flash Comics, All Star Comics, The Brave and the Bold, Mystery in Space, Justice League of America and other DC titles. ll incarnations of Hawkman used the wondrous "ninth metal" or "Nth Metal" to defy gravity and allow them to fly. The metal is in their costume's belt, and its abilities are controlled mentally. Their wings allow them to control their flight, though they can be "flapped" through use of shoulder motions. The Silver Age Hawkman also had enhanced eyesight comparable (it was said) to a hawk's. He (and, sometimes, the Golden Age Hawkman) was also able to converse with birds, though he couldn't command them as Aquaman could sea creatures. The Silver Age Hawkman also possessed a Thanagarian police space ship and a variety of science fictional weapons. All versions of Hawkman preferred to use archaic weaponry - particularly maces, nets, spears and shields - rather than modern or futuristic weapons. The current incarnation prefers this in part because, having the memories of living through many past lives, he is more proficient in their use than with contemporary weapons. It should be noted that all versions of Hawkman have shown enhanced levels of strength. Whereas the Golden Age Hawkman's strength appeared natural, it was later explained (with the Silver Age Hawkman) that the nth metal enables its wielders to carry great weights. The recent incarnation has interpreted this as the nth metal simply enhancing the strength of the user. It has also been explained in the JSA series that the nth metal greatly aids in healing, closing wounds almost instantaneously. One example is in the JLA story "Crisis of Conscience," in issues 115-118. Carter has his arm nearly severed during one part of the issue, but the wound has obviously closed and functionality returned by the end of the issue. The Atom has commented that Hawkman laughs at anything less than third-degree burns. The nth metal also regulates the body temperature of the wearer, preventing the need for heavy protective clothing while in high altitudes.